Paddleboarding Alton Bay on Winnipesaukee is the best way to experience the lake under your own power! It's safe to say that stand-up paddleboarding has become pretty popular on Lake Winnipesaukee these days. I've enjoyed paddleboarding since it first came to the United States. I started paddleboarding on the ocean, but decided to start paddleboarding on the lake which has turned into an amazing experience. Since 2007 I've been trying different spots on Lake Winnipesaukee to see which one I prefer, and have come to terms with Alton Bay as being the best spot. Sometimes I like to paddle the long stretch of the bay with it's narrow channel, its always covered from excessive wind and the boat wake seems to disappear fast. Then there is the bridge on the backside of the Bay and if you paddle under there it is a lazy river experience like you will never see again on Lake Winnipesaukee. Not only is it like a sheet of glass in there, but the narrow channel is a really cool backyard experience. Once you get going down there a little bit the water will get clear and you can see fish, turtles and different creatures in the water. As you go through this hour long paddle you will see many birds and a few Great Blue Herons. This is because there is a bird sanctuary half way down stream. Just give it a try, you will love it. SUP is a great company. Chris has found a wonderful place to set up shop. I have gone on his paddleboards under the bridge and had the 'backyard' experience. It is nice and serene. I didn't have to paddle fast to get a great workout. Full body workout and relaxation at the same time. I love it! I agree. 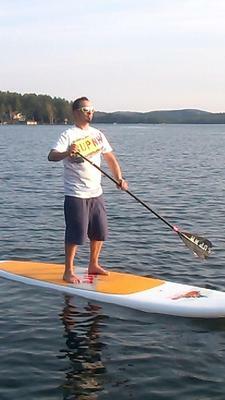 Paddleboarding is a fun way to experience Lake Winnipesaukee. Even if you can't make it to Alton Bay, there are fun little coves all over the lake to give it a try.